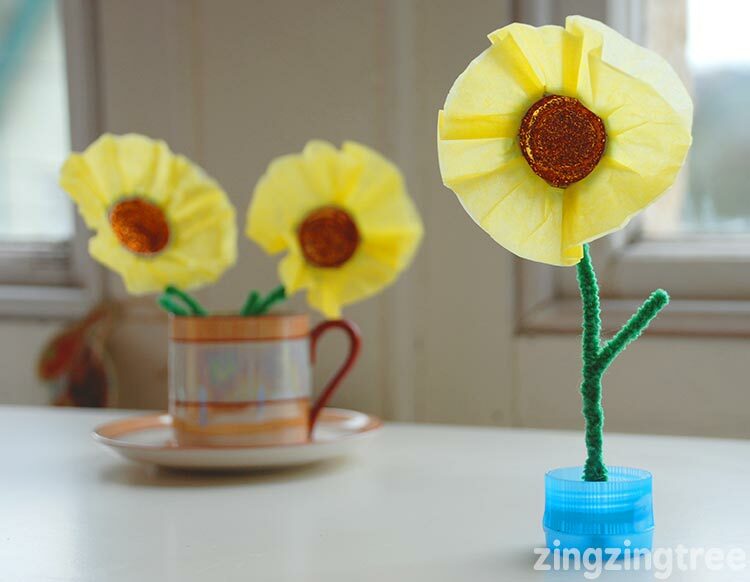 Spring is definitely in the air and these Plastic Bottle Top Spring Flowers are perfect for bringing some everlasting Spring colour not the house. They look amazing and are actually really quite simple to make. Plastic bottle tops (these are from milk cartons, glitter, tissue paper circles, 30 cm pipe cleaners and glue. 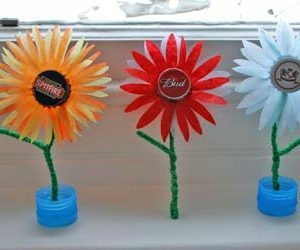 If you have any metal bottle tops then you can find how to make some simple flowers using them in another blog post here. 1. Take a pipe cleaner and wrap it around your milk bottle lid and secure the end. Do this for all the bottle tops. Then carefully remove all the bottle tops. 2. Spread a generous amount of glue inside the lids and sprinkle with glitter. Set aside to dry. 3. 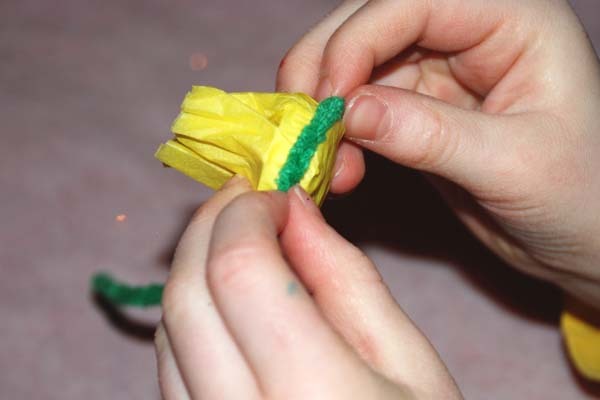 Take two tissue paper circles and fold them in half lots of times so they end up ridged. Glue them together and then glue the back of a glittered lid onto the centre of them. 4. Carefully pull the tissue paper down the sides of the bottle top and scrunch together. 5. Get your pipe cleaner and slide it back on to the bottle top. 6. Bend the pipe cleaner in half and twist leaving a little bit free to make the leaf. This was part of another crafty hangout organised by Red Ted Art. Watch the video below for more fantastic ideas. How adorably and cute! I’m so crazy about bottle top crafts. We recently made a memory game out of them. 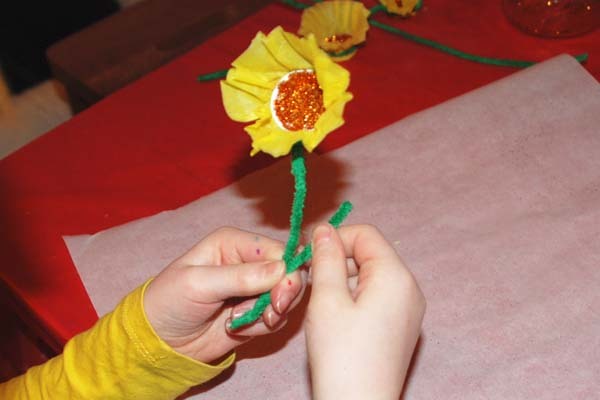 PS Thanks for sharing on Kids Get Crafty. So cute, all your crafts are so amazing! 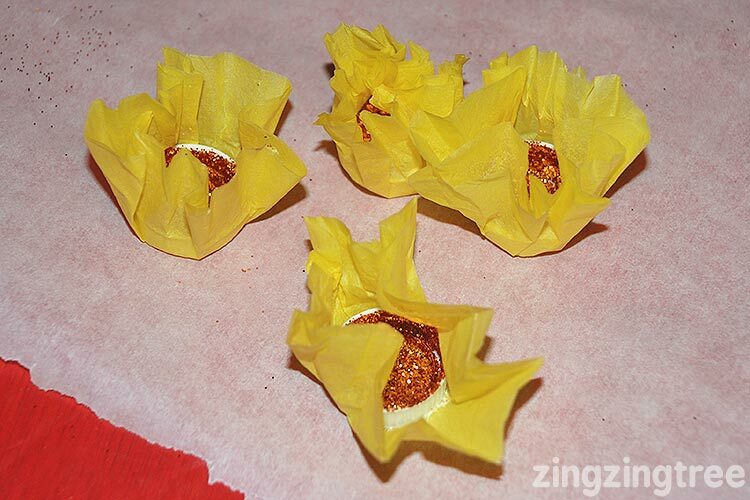 We are going to try it using muffin tin liners instead of the tissue paper! 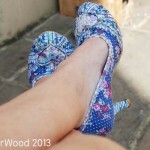 These are wonderful!! 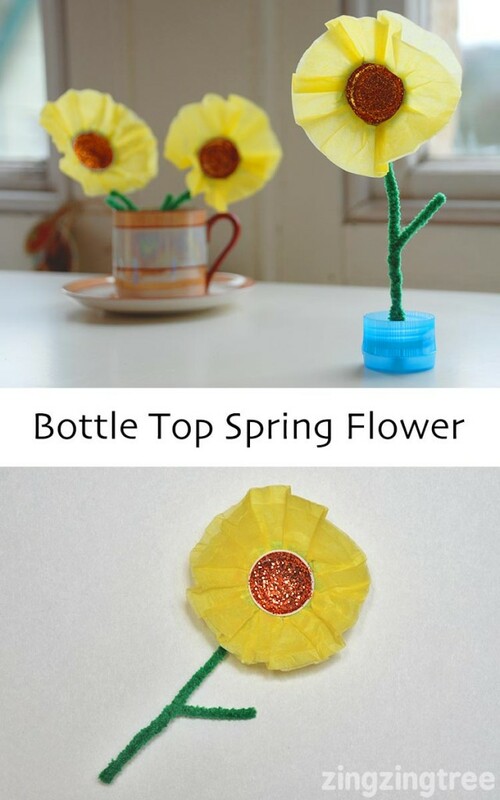 I know we will be trying them at my house since my daughter always wants to make flowers. Thank you for sharing at Sharing Saturday!! So cute and simple, love it! I like the posts so much I featured it on our “The Kid’s Co-op” post! 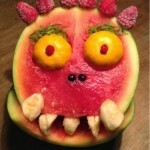 so imaginative! love these flowers! How did you get the one in the picture to stand up in the bottle cap?